(0 Customer Reviews) | Write Review 12 issues per year Railnews is the number one publication for the rail industry, focusing on the people and business that keep today’s railway running. Originally produced in 1963 as the house newspaper for British Rail, Railnews continues to inform and impress in the modern industry. As well as in-depth editorial, the newspaper features views and opinions from readers and industry insiders alike. 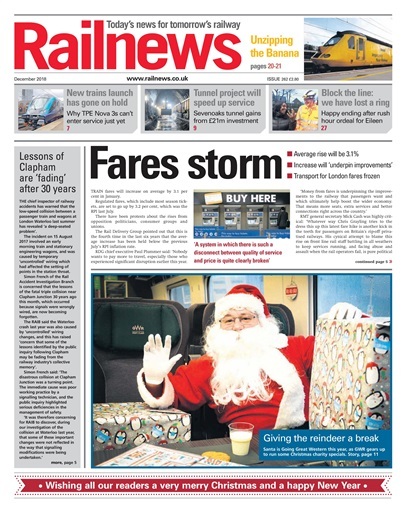 THE announcement of the average fare rise next month coincided with press day at Railnews, and the front page was cleared to report the reactions, mainly critical, from industry figures, politicians and other commentators. Another report this month looks back 30 years to the Clapham Junction accident in December 1988. The RAIB’s chief inspector has warned of ‘concerning’ similarities with last year’s collision at London Waterloo, and he is worried that the industry’s ‘collective memory’ is fading. Elsewhere, Arriva has been blamed for train shortages by the Welsh transport secretary. Ken Skates described the first Wales & Borders contract, which ended in October, as ‘dreadful’. Arriva denied it was responsible for the problems. The programme director for Thameslink has been named as the first chief executive of East West Rail, while the dates for a public inquiry have been announced. Franchises are still making headlines. FirstGroup and Deutsche Bahn have started talks with the Department for Transport over reviews of South Western Railway and Northern after revenue fell short this year. The Christmas break will involve very little in the way of festive fun for 25,000 Network Rail workers, who will spend the holidays on upgrade projects costing £148 million. A call to boost the role of Community Rail Partnerships has been made by the government, 11 years after the last Community Rail Strategy was published. Hot Topic considers the question of speed and suggests it is still the trump card in the railway’s hand, in spite of critics who want to reduce the speed of HS2 to save money. Finally, a Network Rail track team may have scored a first when they asked a signaller to block a line so that they could search for a dropped wedding ring. To find out if they succeeded, see Railnews for December. Railnews is the number one publication for the rail industry, focusing on the people and business that keep today’s railway running. Originally produced in 1963 as the house newspaper for British Rail, Railnews continues to inform and impress in the modern industry. As well as in-depth editorial, the newspaper features views and opinions from readers and industry insiders alike. You'll receive 12 issues during a 1 year Railnews magazine subscription. You'll receive 12 issues during a 1 year Railnews magazine print subscription.